We’re honored to have won Cookeville’s Small Businesspeople of the year award. Thanks to everyone that voted and to all of our amazing clients and the Green Arrow Design team. 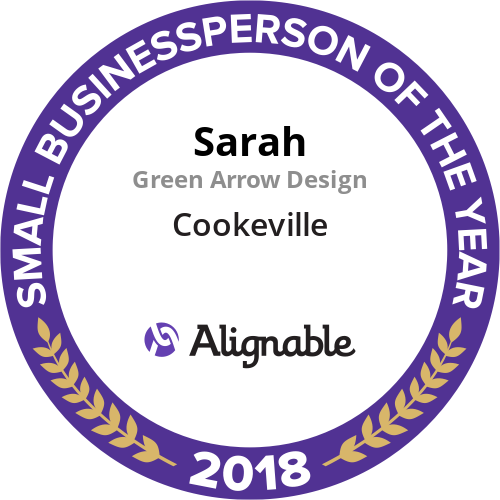 After two months of nominations and voting, we’re delighted to announce that there’s a tie for Cookeville’s 2018 Small Businessperson of the Year! The winners are Sarah of Green Arrow Design and Patty Seagrave of Seagrave Mortgage. Cookeville’s winners have received personalized badges to celebrate this achievement. The badge can help drive more prospects, visibility, and recognition on our Alignable network for the rest of 2019 and beyond. We encourage each winner to share the badge on other social media, blogs, and external sites, as well.